This is the public profile of Mac Huang, Additional information and high-resolution images are available for accredited press members, to access additional information about Mac Huang please login as a press member. About Mac Huang : I seek to take "people" as the home's center, and propose a living proposal in keeping with the homeowner's essential needs.I try to strip away formal stylistic elements and superfluous décor, while preserving the homeowner's personality with a minimal design and creating an ideal living space. Less, but Better is people-oriented design that maintains only necessary elements and functions. It delivers solutions through design that rationally interprets framework of original architectural space and builds dialogues with the space. 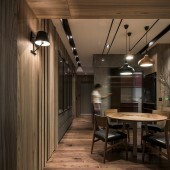 Mac Huang has experience and expertise in designing offices, residents, businesses, restaurants, etc. over more than 10 years of practice. He created XYI Design in 2010 and set up XWD Design Group in 2014, providing an integrated solution model combined with brand design, life aesthetics, and fine engineering management. The group’s business scope covers Taipei, Hong Kong, East China, South China, Central China, Manila, and other Asian regions. As an award-winning organization recognized in China and other countries, the company devotes itself to enhancing brand value and excels at integrating brand with space design to improve customer experience and commercial value. 2017, Finalist in the public space category, SBID. 2017, Idea-Tops International Spatial Design Award. 2017, Finalist, Japan's Good Design Award. 2017, HK A&D Trophy Awards. 2017, Grand prize for best color design, USA Interior Design Award. 2017, Bronze medal/ Outstanding award, 7th China International Spatial Design Competition. 2016, Outstanding Award/ Best Office Space Award, US Interior Design Award. 2016, Finalist in the office space category, SBID. 2016, Finalist, Japan's Good Design Award. 2016, Best breakthrough creative design of the year award, PCHOUSE fashion design ceremony. 2015, Best office spatial design, WAF (World Architecture Festival) INSIDE Awards. Press Members: Request an exclusive interview with Mac Huang.